The Law Reform Commission has made some recommendations. PARENTS MAY NO longer have a “moral duty” to make proper provision for their children in inheritance under new proposals being tabled. The Law Reform Commission (LRC) is recommending that legal rules be changed to so that “moral duty” is removed from Section 117 of the Succession Act 1965. Instead, the LRC has said that the law should simply provide that a deceased parent has a duty to make “proper provision” for a child. “The phrase “moral duty” may unduly emphasise an expectation or entitlement to inherit, rather than an appropriate focus on the needs of a child, including an adult child,” according to a lengthy report by the LRC. The report is part of a review of the ability of courts to make amendments to a parent’s will. In publishing the report on its website, the LRC provides a number of case studies to demonstrate the importance of the principles involved. The names in the cases are anonymous as the cases are heard in-camera. 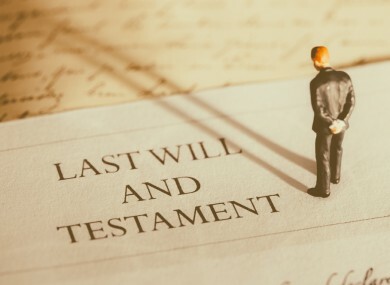 Any amount left in the will to the surviving spouse; the number of children, their ages and their position in life when the parent who made the will dies; the parent’s means; the age, financial position and prospects in life of the person making the claim under section 117; whether the parent has already made proper provision for the child; and the facts at the date of death, not when the will was made. A section 117 case decided in 2015, the SF case, involved a situation directly related to the economic crash that emerged after 2008.The estate is this case was worth over €14 million, and the parent’s will had divided it equally between his 6 children.One of the children, who brought the case under section 117, had worked in the family business instead of pursuing his own independent career. When his father was alive, he had sold to the plaintiff some development land for €1.2 million: this was financed by a bank loan to the plaintiff, which had been guaranteed by the father. Because of the economic crash, the development land was worth just €160,000 in 2015, but the plaintiff still owed €1.6 million on the bank loan. This meant that the plaintiff was in a much worse financial position than his siblings because much of his share of the estate would be needed to pay off the bank loan. “Against this background, the High Court decided that the father had failed to make proper provision for the plaintiff because he had not referred in the will to the loan guarantee he had given the plaintiff; and because the guarantee was now worthless the plaintiff was in a considerably worse position than his siblings because much of his share of the estate would be required to pay off the balance remaining on the bank loan. Email “Parents may no longer have a 'moral duty' to provide for children in wills ”. Feedback on “Parents may no longer have a 'moral duty' to provide for children in wills ”.